Gorgeous picture! 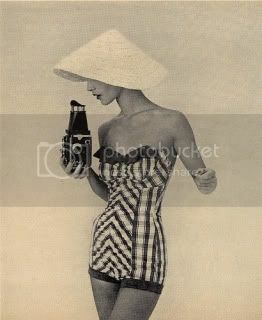 Great bathing suit and fabulous hat. Plus, how fun would it have been to take pictures with camera like that! That is a gorgeous retro photo! ~smiles~ There are times when I feel as though I missed my decade, and others when I wonder if I was there in a prior life. Oh I agree, J Cosmo, the camera would be a blast! Original B&W with an old time look...awesome!